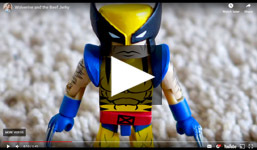 Here is a Luke's Toy Store commercial called "Wolverine and the Beef Jerky" that we have been running on Facebook ads for the past few weeks. I thought I would post it here as well, since we had a lot of fun making it. I was trying to show people new to Minimates how you can swap their parts and accessories, while also hopefully making them smile. Click the Read More text below to watch the video!